Umm...Did I forget about this place? I hope to get back into food blogging soon. My budget is much, much smaller since the home purchase so it will be interesting to see what I can do! I've discovered my love of Indian food so that may be a frequent dish in the future. My buddy Christine has also expressed an interest in bringing back our Two Hot Chicks Baking/Cooking. That will definitely be fun! See you all (well all two of you! lol) soon! Recently, I was shopping at Costco and they had two pound containers of pre-cut butternut squash. Butternut squash is one of my favorite vegetables but it can be a real pain to cut up sometimes so I was very happy to find it already peeled and diced. Oddly enough (or not really!) when I have butternut squash, normally I make risotto. It's one of my favorite meals to make but this time I wanted something a little different. So I made soup! Wait. What? Soup? Really Heather? Yep. I made soup. The biggest reason really had nothing to do with the type of recipe I wanted to do. I had been rather bad at lunch that day (a hamburger was involved) and I needed a low point dinner, preferably with a focus on veggies. 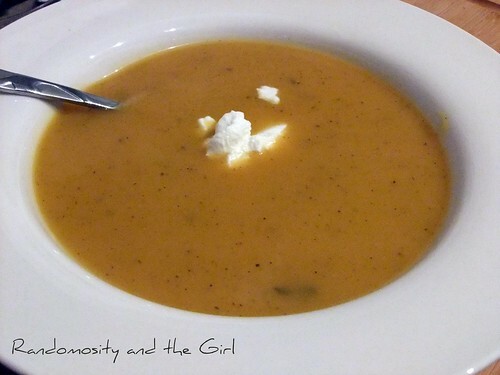 As soon as I got home, I did a quick search and found a butternut squash soup that sounded just perfect. I did make some changes to it starting with the butternut squash. I love how slightly caramelized butternut squash gets when it's roasted. It brings a great depth of flavor that I thought would be wonderful in soup. The original recipe called for an onion but not being a fan of onions, I usually don't have any in the pantry. I used onion powder instead but you could very easily substitute with chopped onion. The last thing that I changed was just pureeing the soup instead of how it was originally written since I roasted the squash ahead of time. I then left out the final amount of water since it would have made the soup thinner than I wanted. This was a delicious and surprisingly filling soup. It was worth 4 P+ making it a great bargain as well! Great for light dinner and even better the next day for lunch after the flavors have had a chance to develop more. I served it simply with just some whole wheat saltines on the side (though one day with leftovers I served it with roasted cauliflower). This recipe is definitely going to be made again and again! Heat oven to 425℉. Toss olive oil, squash, sage, and rosemary. Bake for 30 minutes or until slightly carmelized. Add the roasted squash, onion powder, and broth to a pot; bring to a boil. Reduce the heat and simmer about 20 minutes. Using an immersion blender, puree until the soup has a fluid but creamy consistency. Garnish each serving with a tablespoon of the sour cream and a sprinkle of the additional sage, if using. I love me some taco soup. My mom used to make it often when I was a kid (probably still does actually) and it was always one of my favorites. I'm pretty sure, however, that the recipe she made was totally not Weight Watchers friendly but I've wanted to make it many times in the last year...just a healthier version. I had not found a recipe that sounded as good or at least nearly as good as the one I grew up eating. Then in steps Gina at Gina's Skinny Recipes with her delicious and healthy recipes. 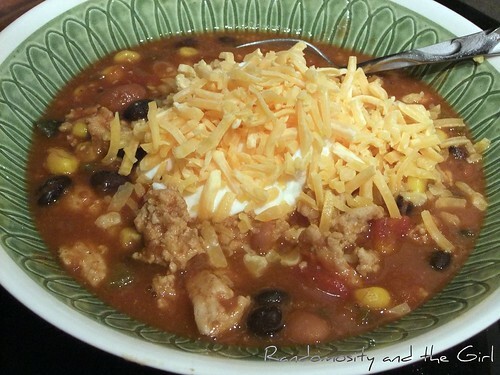 She recently posted a turkey chili taco soup that sounded divine and right up my alley. Thankfully most of the ingredients are pantry staples for me so I was able to pull this soup together fairly quickly for dinner tonight after work. I topped mine with my standard chili fixins' of shredded cheese and sour cream. Let me tell you...this was one delicious and filling soup! Because it was slighter cooler today than the 70℉ days we've been having lately, it was perfect to make for dinner. It wasn't terribly heavy though so it would probably be just as tasty on a warmer day (I'm sure I'll find out soon!). One of the best things about it is the 5 P+ per serving. I love that the low P+ allowed me to splurge a little on the toppings and use a higher fat cheese than I normally would use. A great, healthy soup that I will make again and again. Thanks Gina! Makes about 9 - 1 cup servings. During my semester abroad in London a few years ago, we took a weekend trip to Madrid. Our first day there we went to a restaurant for a light lunch before we started sight seeing. Before we even looked at the menu, our professor told us that we might see something familiar that really wasn't. Obviously, we were a little confused. Then we saw it...the tortilla. The tortilla that most of us had grown up with was the flat round bread that you wrap around a tasty filling. This tortilla, on the other hand, was eggy with a potato filling. To me that was a frittata or even an omelet. Regardless of what we thought it was, it was delicious. 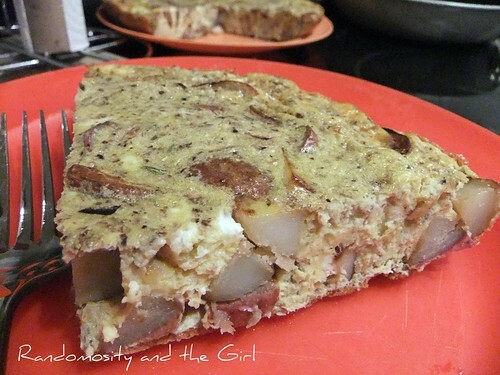 I've never made one at home (at least what was called a tortilla anyway) however so when I saw that this weeks French Fridays with Dorie was the basque potato tortilla, I knew it was time to give it a try. I decided to (kinda sorta) mix two of the options for the tortilla. I went as written but added in a cup or so of finely chopped shiitake mushrooms that needed to be used up. For my potatoes, I used some baby red potatoes that I had and diced them. I've found that it's easier to use the baby potatoes when you need them diced. You get more evenly diced pieces and when you are as bad as me about getting even pieces, you want to use the easiest option. I reduced the amount of oil by half so it would lower the points per slice. Other than that, it was the only change I made. If dividing it into four pieces as a lunch main course, it came to 7 PointsPlus a piece. If you divide it into 8 pieces as an hors d'oeuvre serving, it was 4 Points Plus. I served it as a lunch main course and while it was delicious, it was too much. Next time I would serve it in the smaller portion size so it would not be so heavy. I'd also add more rosemary to the mix. While I don't like a lot of rosemary, it was a little too light for me. It would also be delicious with ham added as Dorie mentions in the bonne idée section. This was a tasty light lunch that I can see making many times in the future. It was a nice, easy meal to make during the snow/ice craziness that we've been dealing with in DFW this week. Next time I might play around with the filling and see what other low PointsPlus options I can find. You can find the recipe on pages 142-143 of Around My French Table. 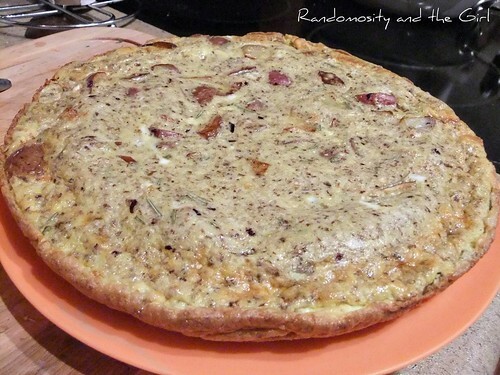 Check out the post here for more tortilla from FFwd members! I know this is not a food related post but this is called Randomosity and the Girl so I thought we could use a little more...random around here. I'm going to try to post more non-food posts in the future. Especially weight loss related since I'm almost 40 lbs (woo hoo!) down on Weight Watchers. Of course, it all depends on school. I'm half way through my master's so we will see. 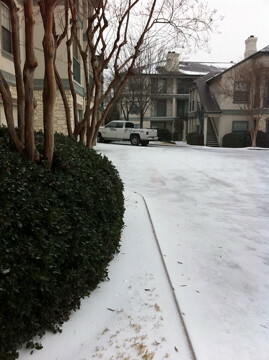 We had ourselves a little 'snow' day here in Dallas today. Those in the Northeast see much, much more than we have so far but for Dallas...this was a lot. 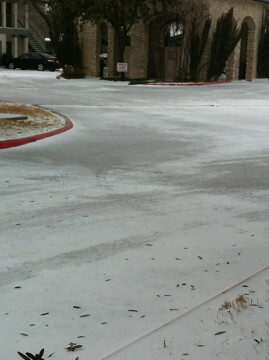 The parking lot in my apartment complex was pretty much a sheet of ice. DISD closed for the day so my office shut down as well. And it looks like I'll have tomorrow off too because DISD has already posted their closure notice. Woo hoo! I think that's more snow days than I got when I was in school as a kid. 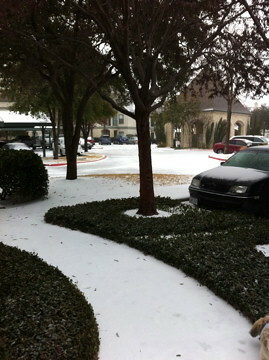 This is Texas after all. We can get pretty chilly in the winter but snow/ice isn't all that normal. At least not when it comes to sticking to the ground. 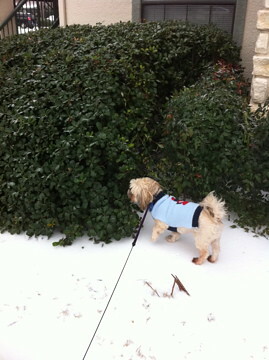 Aww...doesn't my baby look so cute in his little sweater? He only gets to wear one about once a year since I'm a little forgetful. I know. I'm a bad mom. Charlie loves the snow. He prances through it, sniffing every little section he can. My mom's dog, Sugar, on the other hand refuses to go outside. It was quite funny to listen to people try and leave the parking lot this morning. And scrape ice of their windows. Oh the joys of having an attached garage! And not having to go to work! Apparently, we aren't going to warm up for a few days so it's going to be interesting for a few days. Dallas drivers freak out at the little hint of precipitation so continued ice on the ground is no doubt going to through most people for a loop. Hopefully, I'll be able to avoid all that and stay nice and warm inside! Randomosity and the Girl by Heather is licensed under a Creative Commons Attribution-Noncommercial-No Derivative Works 3.0 United States License. All Original Photos and Text © 2008-2011 Randomosity and the Girl unless otherwise noted.